Someone who is chosen or elected to vote or to act for other people: "Lorna's brother was chosen as a delegate to attend the state convention to help choose a candidate to run for congress." 1. To speak and to act for others; to represent: Every state will delegate a representative to go to the political convention. 2. To entrust an authority, rights, etc. to a person acting as one’s agent or representative; to entrust, to assign, to commit to the care of: Sharon's cousin delegated her legal powers to her son. © ALL rights are reserved. A person who is authorized to act as a representative for another person; a deputy or an agent: Earl has been chosen as a delegate to the convention to represent his community. As a delegate to the congressional meeting, Kendra intends to vote for tax saving measures. 1. Relating to being pleasing to the senses; especially, in a subtle way: The delicate color of Mona's dress was very attractive. 2. Descriptive of being easily broken or damaged: This cup is very delicate and fragile; so please handle it carefully. 3. Referring to being disturbed or upset: Many people struggle to maintain the delicate balance between work and family matters. Andrew's mother asked him to go to the store to purchase delicate china cups from which to drink the new tea that has such a delicate taste. Timmy was very careful because his mother’s nerves were very delicate and he was happy to be her deligate; especially, since he knew that the owner of the china shop would give him the best quality available. 1. To give control, responsibility, authority, etc. to someone: The manager will delegate authority to the best employees of this company so the project can succeed. 2. 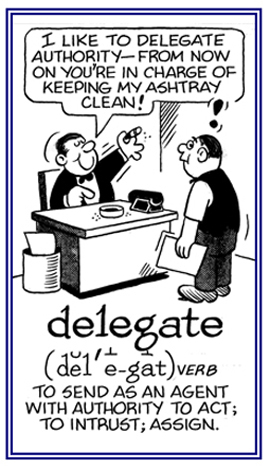 To give authority to another individual: The president will delegate the union leader as a delegate to the convention. To assign an idea or a concept to a place of insignificance or to put something out of one’s mind: After the long argument, Brooke was determined to relegate the conflict out of her mind and to think of other things. When the head librarian decided to delegate Krista to represent her library at the conference, she was concerned about the efforts of a minority to relegate the discussion of new books for the library to the bottom of the agenda.